Anterior knee pain is pain that occurs at the front and center of the knee. 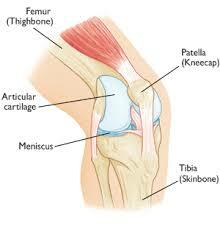 Your kneecap (patella) sits over the front of your knee joint, and involves the patellar and quadriceps tendons. Anterior knee pain refers to a number of different conditions. These include runner’s knee (patellar tendinitis) and chondromalacia of the patella. Anterior knee pain is more common in adolescents and healthy young adults, especially girls; people who are overweight; as well as runners, jumpers, skiers, cyclists, and soccer players. Knee pain localized to the anterior portion of the knee, either retropatellar or peripatellar. Usually a gradual, non-traumatic onset aggravated with increased activity, running, squatting, stair climbing or prolonged sitting. Symptoms normally decrease with rest. No running, jumping, marching, squatting. Refer to Physical Therapy if none of the above but progression of atrophy or persistent symptoms.